To troubleshoot flea callbacks, focus on the life stages that are most abundant. 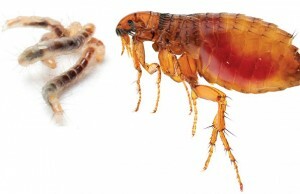 It’s estimated only about 5 percent of a flea population is made up of adult fleas. The other 95 percent consists of pupae (10 percent), larvae (35 percent) and eggs (50 percent). Make sure the management program being provided to the client reflects these numbers, and focus your troubleshooting efforts on the largest segment of the population. Female fleas begin laying eggs within 24 hours of finding a mate and host. They lay 24 to 48 eggs a day — a mass equal to their body weight — for the rest of their lives. Eggs and larvae can be controlled through the use of insect growth regulators (IGRs), which essentially arrest flea development in the immature (non-biting/hopping) stage, and stop the population from growing. Focusing treatment on the immature stages will have the greatest impact on control. Flea eggs aren’t sticky; they fall off the animal after they’re laid. The greatest proportion of eggs will be found in areas where the animal spends lots of time lounging or sleeping. Subsequently, this is also where the majority of the larvae will be found. Interview your client to learn where the pets spend time, and treat those areas with IGRs. By focusing control on the large reservoir of eggs and larvae in a structure, a flea population can be crushed and your callback problem will be cured. You can reach Dr. Jim Fredericks, vice president of technical and regulatory affairs for the National Pest Management Association (NPMA), at jfredericks@pestworld.org.